Former Yorkshire & the Humber Euro MP, Diana Wallis, received the Outstanding Political Initiative Award this yesterday in Riga at the 112 Awards Ceremony for her work in promoting Europe’s emergency number 112. Diana Wallis, who has long campaigned for greater awareness of the Europe wide emergency number in the UK where knowledge is amongst the lowest in Europe, is to receive the award under the Category of Outstanding Political Initiative. 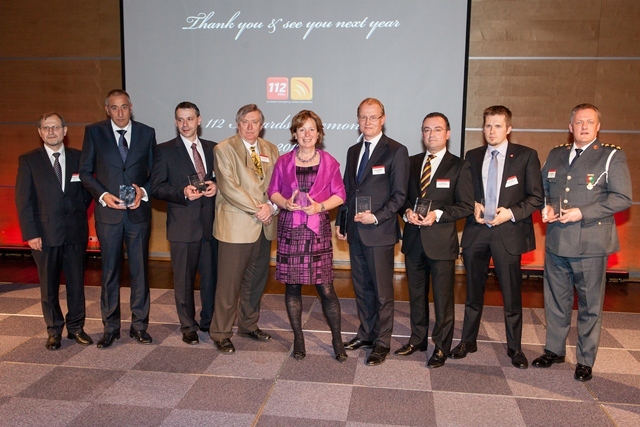 The award is amongst several presented by the European Emergency Number Association (EENA) in Riga on Wednesday. In 2011, Diana Wallis launched a campaign, enlisting the support of the different airlines and ferry companies routing from the UK to continental Europe, asking them to inform their passengers about the 112 number. By Easter 2011 Diana Wallis was joined by companies such as Easyjet, P&O Ferries, British Airways, BMI, Thomson, Iberia and DFDS who in different ways have promoted the number when they didn’t before. This includes pieces in in-flight magazines, in flight announcements, details printed on tickets and other initiatives. “We are delighted to reward Diana Wallis who deserves our full recognition for her initiatives which will contribute to making our everyday life safer”. “Obviously I am delighted to receive this award but I am more delighted that it is an indication of the support UK carriers have shown over the past year in raising awareness for the 112 number”. 112 is the common emergency telephone number that can be dialled free of charge from any telephone or any mobile phone in any country in order to reach emergency services in the EU.